Wow, I got an e-mail that dedexer 1.5 got included into Softpedia. The funny thing is that it got included into the Mac development tool section. I have already got a number of questions from Android developers working on Mac. Is it so that Mac is a favourite platform for Android developers or is it just my fortune? Any opinions? 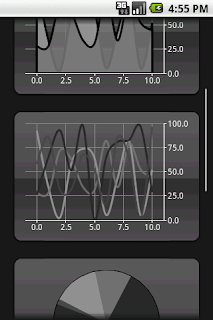 It seems that a sure sign of the maturity of an application platform when graph libraries start to appear. Android definitely got to this stage with aiCharts. I didn't discover it myself. I got a mail from the authors. Even though aiCharts is a commercial product, the Android component market is still nascent enough so that they deserve advertising (even if it is only my lame advertising). aiCharts comes with flashy demonstrations and a number of demo programs. There was only one limitation I was able to discover: the demo programs require the latest API version and according to the authors, aiChart will not run with lower than Android 1.1. Another limitation is that ArtfulBits obviously wants to make money out of the product so the thing is protected by license key. I also received this chart from them that I now share with you. If you need a chart library, at least you know what options to choose from. Just a short post for those few who do Dalvik bytecode analysis: dedexer has now full annotation support! For example it now decompiles "throws" and inner class annotation, along with custom annotations. Go for 1.5 release to get it.